Q & I took a much needed weekend away over the Columbus Day holiday weekend. In fact, it was the first time in our 2.5 years together that we’d gone away just the two of us. Long overdue indeed! With a somewhat tight budget for our getaway, we scrapped our initial plans for Colorado and went to Maine– same idea for outdoor activities, quiet place, but a lot closer. We originally were thinking of heading to Acadia National Park, but it’s about a 5ish hour drive from our home and neither of us was feeling like doing all that driving, so we settled for Boothbay Harbor, Maine. It was just over 3 hours from home, so it felt enough like a getaway and close enough that we weren’t both cranky in the car. We both took Friday off from work to make it a relaxing four day weekend ( shouldn’t they all be that anyway!?!). We originally were booked for three nights at our hotel, but about a week ago we decided to come home on Sunday so that we could skip some of the holiday traffic and feel more relaxed at home on Monday before the work week, instead of frantic. Best decision ever. Since we are now a one- car family since Q has a work truck, my little Hyundai with 164,000 miles on it wasn’t something we wanted to be traveling in, so we borrowed my Mom’s car and left the area late morning. It started raining once we hit the NH border and didn’t stop until late Friday night in Maine. Between the drive and the rain, we were fairly tired by the time we reached Boothbay. We stayed at the Beach Cove Waterfront Inn, which was a quiet spot away from the busy harbor and had a comfy room that was recently renovated. Friday night we ate at McSeagull’s, where I would have, unbeknownst to me, my only seafood of the weekend. It turns out that Boothbay is like so many New England seaside tourist communities– they essentially shut down in the winter. While I expected that, I didn’t expect that a lot of the businesses wouldn’t wait until the end of the Columbus Day weekend to close. We came across more than a few spots that had already shuttered their doors for the season. It’s a good thing we didn’t end up staying an additional day, or we might have been eating crackers in the hotel room Sunday night! That aside, we had a truly wonderful and relaxing weekend. Even though it was quite chilly on Saturday, the sun was out and we were anxious to spend time outside. 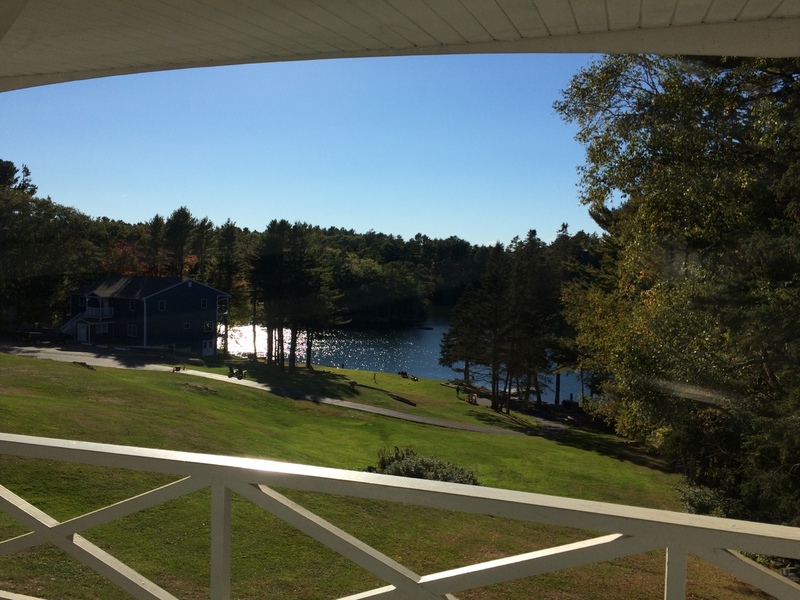 We walked the many trails and paths at the Coastal Maine Botanical Gardens and visited the Fall Foliage Festival at the Boothbay Railway Village. We tried some great new beers at the Boothbay Craft Brewery and Q had one of his favorite corn beef hash breakfasts ever at the Wave Cafe. Even though we’re on a tight budget, we’re committed to getting out of routines and house a bit more because we had so much fun and laughed the whole time, even when one of the restaurants told us they were out of almost everything on the menu since it was their last night open for the year. The biggest takeaway from our weekend away was that we have to make getting away together more of a priority.